EPI and Dogs - Recently I got a question via my contact page here on the website about "runny poos". Through the course of several other emails Lynn and myself went through her discovery of EPI and the later diagnosis of her dog with it. I asked her if she would be willing to share her story and Lynn graciously accepted the challenge and below are the results. Not only does she give details of how she dealt with discovering EPI and her regime for dealing with it with her own GSD, Maya, but she also willingly shares a few prime resources for people to get products for their own EPI dogs. I hope you enjoy reading it, but most of all I hope you learn something new about EPI and Dogs. Because it is important - and if you own a German Shepherd, your chances of coming in contact with this condition have just increased exponentially. EPI and Dogs - This is a story about a disease. A disease, as it turns out, that is found mostly in the German Shepherd breed but is now being found in a lot of other breeds in vast numbers and it all has to do with a dog’s pancreas. The pancreas is the organ near the stomach and gall bladder that secretes enzymes ( protease, lipase and amylase ) to digest protein, fats and carbohydrates in the body. Exocrine Pancreatic Insufficiency is the full name of this disease in dogs - aka, EPI and Dogs. The dog, being a direct descendent of the wolf, shares the same DNA. When you see a wolf kill a deer for instance, it will rip open the stomach and eat the internal organs first in order to get enough enzymes to digest the rest of the deer. Their pancreas is designed to secrete protease to digest protein, lipase to digest the fat and amylase to digest the carbohydrates. Over the years, the dog pancreas is being considerably over worked due to all of the grain and corn additives in dog foods. Dogs simply do not produce and secrete enough amylase to digest all of the carbohydrates that are put into cheaper commercial dog food brands. Thus, veterinarians are seeing a lot more digestive issues in dogs. Whether EPI and Dogs is becoming increasingly more prevalent because of the cheaper additives in dog food or whether it is from breeding two dogs with recessive genes for EPI is completely unclear at this point. All I know is Maya has it and I have to deal with it because, quite simply, I love her. The symptoms of the disease are simple if you know what you are looking for. Because this disease is not something a vet sees on a regular basis it is very difficult to diagnose on the first few visits. Dog has diarrhea treat with Metronidazole, second visit treat with Tylan, third visit treat with amoxicillin. All the while you are trying all kinds of different dog food brands, desperately hoping one will agree with your dog and the diarrhea will end. But it doesn’t concerning EPI and Dogs. Then all of a sudden you look at your dog and you see nothing but bones and a big head and small skeletal body. This is when you realize that something is terribly wrong and your dog is actually dying right before your eyes and you feel so helpless. 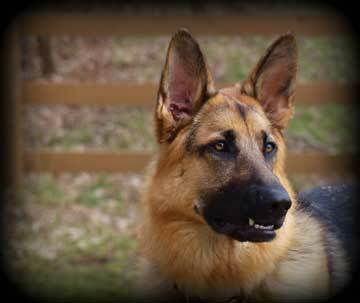 So, I googled German Shepherds and runny diarrhea and up came a host of web sites describing EPI. All of the symptoms were there. Runny cow paddy loose stools, mustard yellow or taupe brown in colour, ravenously hungry all the time and losing weight, eating poops, burping, gassy, tummy grumbling after every meal and throwing up watery bile. I made an appointment with my vet after I took a picture of her poop and compared it to a poop on a site called epi4dogs.com and asked my vet to please run a TLI test to test for EPI. It was at this appointment that I hit my low point. She was down about 15 pounds from her 72 pounds a month earlier. Days later the vet called and it turned out her TLI test result number was 4.9 which is in the grey area as most EPI dogs are below 2, however, added with all of the other symptoms my vet concluded we would treat her as an EPI case. She did her reading and brought me in some enzymes and put her on gastro intestinal high energy food by Medi Cal made by Royal Canin. I asked for a B12 shot for Maya as I had learned from my group of EPI owners, these dogs have lost most of the B12 in their system by the time it is diagnosed and can no longer digest it from food. Vitamin B 12 is vital for proper digestion when dealing with EPI and Dogs. 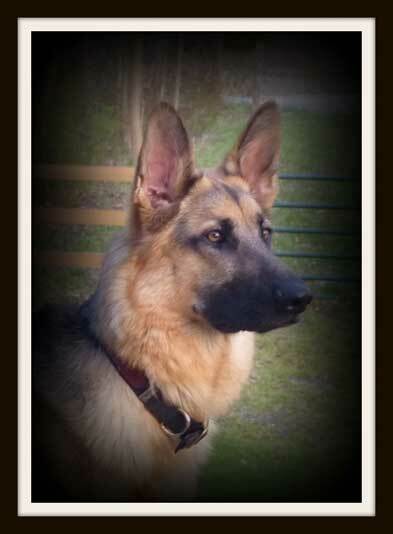 One day after feeding her the above mentioned prescription diet with the enzymes, Maya started doing much better. Her poops became normal, her tummy stopped rumbling and she was sleeping through the night. Within a month she had gained 18 pounds and was back to her normal full of beans high energy self. I have now switched her kibble to a grain free Limited Ingredient diet by Natures Variety. I don’t think it really matters which grain free dog food you choose just so long as it is grain free. Dogs have a hard time digesting grains, especially EPI dogs. The good thing is, there are now lots of good quality kibble available these days as pet food companies are starting to realize how sensitive dogs are to corn and grains. My life savers throughout this journey were the wonderful people who also have EPI dogs at k9-epiglobal@yahoogroups.com. They saved Maya’s life and kept me from having a nervous breakdown. They directed me to enzymediane.com where I buy her Pancreatine enzymes for at least 1/3 the cost of the vet. Had I not heard of enzymediane.com I could not have afforded to keep Maya alive. The cost for a half a kilo through her is $80.00. They are shipped via FedEx and come the next day. I order the vitamin B-12 with Intrinsic Factor on line from wonderlabs.com and the rest of her vitamins I buy at Walmart. Vitamin C (500mgs) and Vitamin E ( 1000 mgs) as well as coconut oil from the health food store. She gets a teaspoon of coconut oil twice a day for her coat and skin. Or you can give a wild salmon oil capsule once a day. If the Vitamin B12 does not have Intrinsic Factor it will not work. The intrinsic factor is the enzyme that allows B12 to be absorbed into the bloodstream and not destroyed by stomach acids (just something I learned from my EPI group). Because I am always afraid of Maya getting SIBO ( small intestinal bacterial overgrowth ) from fermenting food in the gut she gets two tablespoons of pro biotic plain lactose free yogurt every day. And that is pretty much the story. It is a shame that most vets are not familiar with this disease (EPI and Dogs) as time is of the essence in a young dog with EPI. Brain and bone development happen so quickly in a young pup that nourishment deprivation at this young age can have devastating effects. If you visit a website called epi4dogs.com you will find all kinds of valuable information that will help with your journey should your dog have symptoms of EPI. I keep wondering what God`s reasons were for giving me Maya and forcing me to struggle with this disease. I think it is because He wants me to help others with their dogs on this journey. EPI and Dogs - it can be treated if you know what to do!